We crushed this test as a class. The average was a 92.5% and the median was a solid 94%. There were 7 perfect scores. 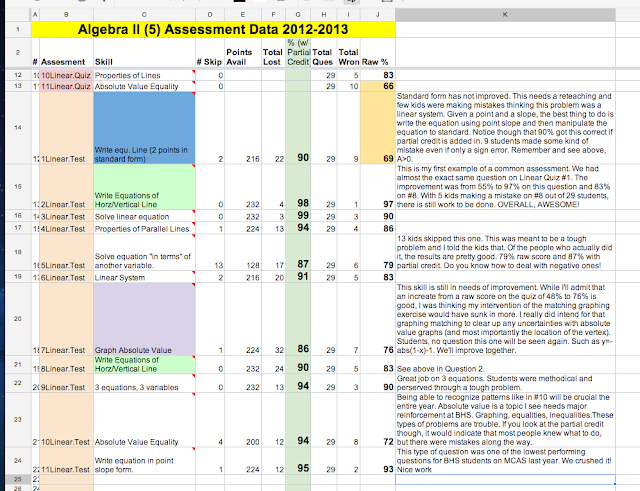 There are 29 students in Level 5 Algebra II. I shared the data with the students today and we made major improvements in my common assessment of "vertical and horizontal lines" and "absolute value." On the first quiz that question had 55% of kids getting this correct and with reteaching we got that number to 97%. If you look at #8 though, a similar question testing perpendicular lines was only 83% correct. On the graphing absolute value question from the first quiz (#5 on the Linear quiz) 48% of students got this one correct. On the test 76% of students got a similar question correct, but I was hopeful that my teaching including the absolute value matching exercise would have made this questions average much higher. Standard form of a line is still an issue as there was no change in the 69% scores on the test and the quiz. In Standard form the Ax+By=C the A must be positive. Most of the credit lost on this question was "minus one" because A was not positive. If I wasn't insisting that A>0, then the average on this problem would be much higher. I'd recommend looking over your mistakes and making sure you understand how to do every problem.